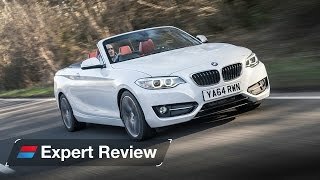 BMW has recently announced its 2 Series models by introducing M235i and our car of day, 228i Convertible 2015 in two variants one being standard and another with xDrive. Powered by a powerful four cylinder engine paired to a six-speed automatic transmission, this new release from our perspective undoubtedly holds several pros to gain your attention. Let us not waste more time and get a closer look to know this new release better. 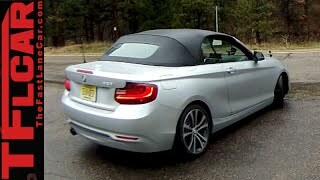 Interior of BMW 228i Convertible 2015 is identical to its coupe sibling it’s just the head room got increased drastically since you don’t have roof to confine it (considering you don’t cover it). Dashboard is catchy with its subtle lines running horizontally. Front seats got a redesigned folding mechanism making the process easier and giving lot of space to move for rear passengers. Apart from lot of seating space there is also enough space in trunk, making your long and heavily burdened tour an easy go. Red colored seats add commendably to the sporty touch inside while the black three spoke steering wheel add an essence of class to interior of BMW 228i Convertible 2015. 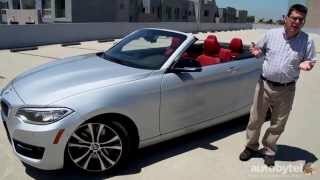 Major change in the exterior of BMW 228i convertible 2015 when compared to coupe is, its rooftop. Apart from this adding to looks are front grille in flowing pattern, well shaped hood and three part lower fascia. Moving towards the rear fascia of BMW 228i Convertible 2015 bumper and taillight hold the roots in its coupe part. However few changes are noticed in making of trunk lid. Slope which we noticed in the coupe model now gets farewell with a flat body once you turn the roof on. This to some might be uninteresting but the overall look is hardly effected by this. Standard 228i convertible comes with 17” wheels while taking a few pennies out of your pocket will add aggression to your convertible with optional 18” and 19” wheels. Last but might be an important feature for most, the removable rooftop which takes 20 seconds to hide it behind the rear seats and can be executed at the speed of 30 mph. 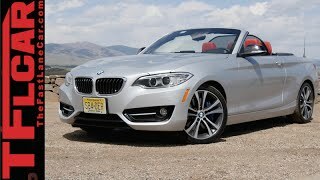 Engine beneath the hood of BMW 228i Convertible 2015 is also a carry forward from its coupe sibling. The 2.0 Liter four-cylinder engine delivers total output of 240 hp and peak torque of 305 nm paired to either six-speed manual or an eight-speed automatic transmission. 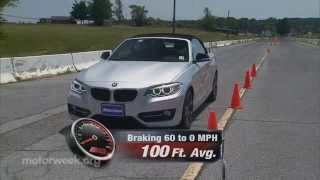 With these figures BMW 228i can finish the 0-60 mph sprint in 5.7 seconds. BMW with this model offers four driving modes: Eco Pro, Comfort, Sport and Sport+.